I told one of my Korean students last month that I am seriously considering a visit to Seoul next year but he admonished me to go to Tokyo instead. His reason, there's nothing much to do in their capital. But I insisted I want to see South Korea. He pressed asking, "what do you intend to do here anyway?" I said, "sightseeing!" He replied , "what? you want to go here and spend much just for sightseeing?" Well, that's how I define a good vacation, primarily for sightseeing. 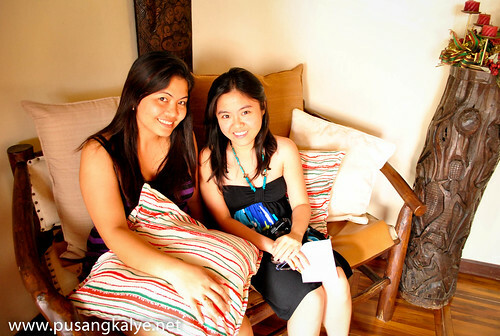 But after the BORACAY MANDARIN ISLAND HOTEL experience last weekend, I modified my definition of a GOOD HOLIDAY. I added the word SPA. 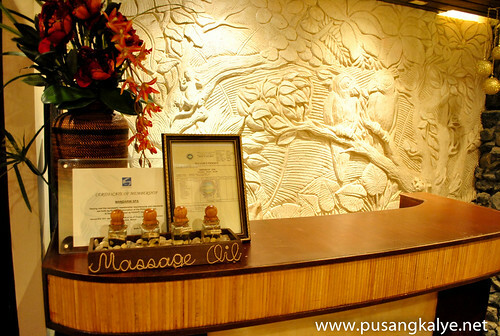 Blame it on the Hilot Massage in MANDARIN SPA. 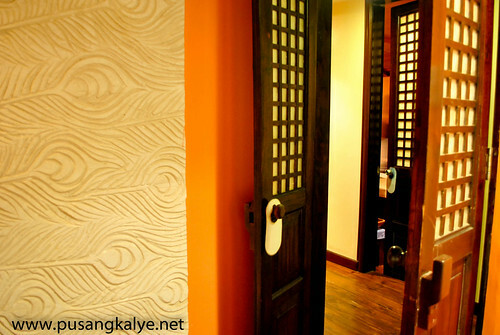 MANDARIN SPA is considered one of the finest wellness and relaxation providers in the Philippines.It is well known for its Traditional FILIPINO HILOT. Here, therapists receive full training in the art of Hilot and other spa treatments such as Hot Stone Aromatherapy, Natural Body Scrubs, Holistic Treatments and Facial Services. 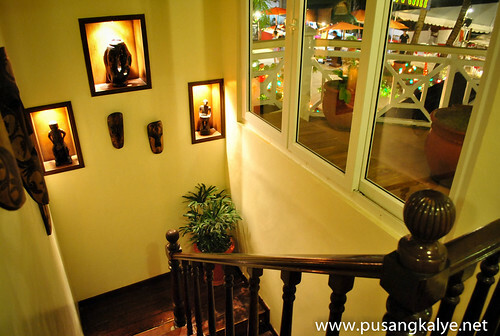 It also houses a Foot Spa overlooking Boracay’s White Beach, equipped with luxurious leather loungers, world-class speakers that play exotic and relaxing music completed with excellent service by the most hospitable and skilled therapists on the island. Facing Boracay Mandarin Island Hotel, MANDARIN SPA is located on it's left wing. You wouldn't miss it when passing along. We had our spa at around 4pm. I have back pains so I decided to have the Traditional Filipino HILOT while my wife tried the Hot Stone Aromatheraphy. 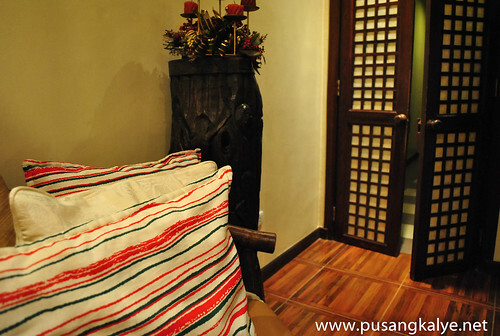 Before proceeding to the massage room, I decided to shower first and stay in the Sauna for around 30 minutes. Male and Female Sauna rooms are located on the ground floor. 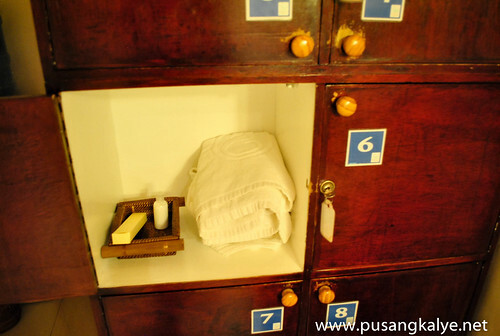 This is also where the lockers are located for your important belongings although you have the option to bring them in the massage room should you decide to do so. I left my things in the locker. I would like to make special mention of the SAUNA by the way.It's the cutest Sauna I have seen. Small yet efficient. 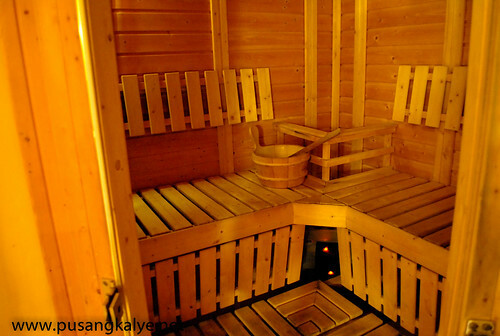 It is a wooden dry sauna which could accommodate four (4) people at the same time.The temperature inside was perfect with the thermometer reading of 65 degrees Celsius. 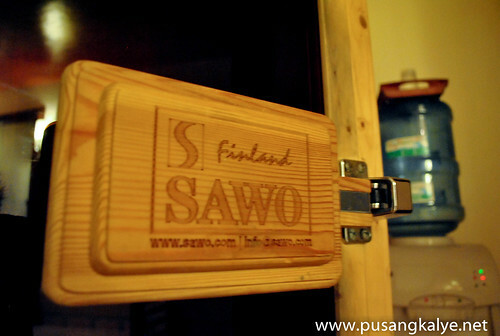 I noticed on the door that it's a SAWO brand from Finland. Finland is world famous for sauna ayt?, so I made a little research about the company. In their website http://sawo.com/, it says "SAWO is a Finnish sauna manufacturerthat has stood up as a major player in the sauna industry by its innovative company culture. SAWO has exceeded customer expectations with its very competitive prices and impressive quality." Good. MANDARIN SPA uses the best products. I later on joined my wife in one of the massage room on the 2nd floor. 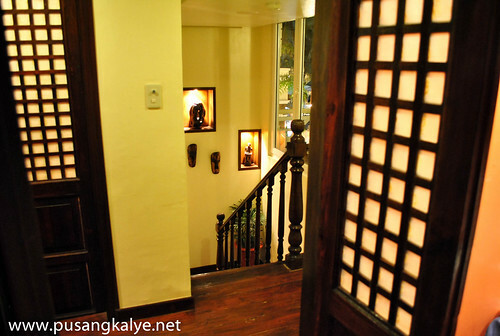 Climbing the stairs, I noticed the cozy interior accented with wooden floor and doors with Capiz shells. A relaxing music is also being played on the speaker. The massage room is spacious, and for those who prefer not using the Sauna Facility downstairs, there's shower inside so you can clean up before the therapy. Dimmed lights also makes the room more relaxing to the senses. For my HILOT Treatment. I was asked my masseur to sit on a chair first. he put a a pillow on my back and started massaging my shoulders and upper back. He then pressed my head and I noticed he started pulling my hair. It was done for a few minutes while my feet was soaked in lukewarm water. My masseur then asked me to lie face down on the massage bed. The whole therapy lasted for 1.5 hours. "restores balance to your entire body by circulation and allow your energies to ﬂow. It’s method and modalities have been handed down from generation to generation throughout the Islands of the Philippines. This thorough head to toe massage attunes your senses and is designed to ease your body’s common ache pains while balancing your body’s energies." muscular tension and balance the spirit." I was a bit pessimistic at first. My standard for massage is one where I should cry in pain. I need deep tissue massage due to the severity of my back pains. I told my masseur to increase the pressure and he was able to sustain it all throughout. I always talk to my masseurs when I get a massage. I do that so I wouldn't sleep and ensure that the masseur do her job correctly. During my first hilot session though, I was completely quiet. I was tempted to ask my masseur the difference between SWEDISH massage ( which I usually have) and HILOT but I simply tried to feel the strokes and figure it out myself. One major difference that I noticed was that he started at my back before proceeding to the legs and lower body. Maybe because in hilot, banana leaves are being heated and applied to your back. It gives a soothing relief as he heated four strips of banana leaves and pressed them at my back. Two strips were later on applied on both my legs. I also noticed that the strokes in Hilot is different. A lot of emphasis is on the upper back. My masseur stroke a particular spot in my upper back many times which is targeted my nodules while giving a relaxing feel. I dozed off for a few seconds several times. I usually prefer deep tissue massage, the means firm and slow strokes to stretch tight muscle mass.I prefer it hard and oftentimes painful due to my consistent back pains. For me, if I didn't feel the pain during the session, it's not effective. With the Traditional Filipino HILOT treatment, my masseur was able to apply pressure not too strong for me to greet my teeth in pain but enough to loosen my tight muscles (especially at the back).I know the tight muscles were targeted and I felt very relaxed afterwards. My verdict, one of the best massage I tried to date. My wife also says the same with Hot Stone Aromatheraphy. No exaggeration. ok talaga ang pamasahe nasubukan ko na rin yung hilot. ok naman. pero mas lalong ok kung ganito kaganda ang spa. Hindi ba nakakapaso sa likod yung hot stones? Alam mo bang never pa ako nakakapagpa-massage? Haha. Me already, right?! amisshoo anton! kahet para taung aso't pusa. lol nice to see you again last time. ang nice naman jan, cge, ikaw na ang rich! ganda t,ga ni wifey ay xempre ni Melody. pasabit sa Korea. hihi i rmmbr Melody has a good accnt of her solo trip sa Korea.